Physicians: NY state does not have CME requirements for physicians. 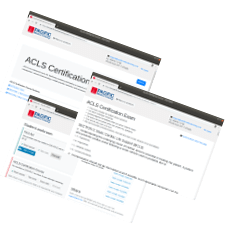 Your hospital may be pleased to know that our ACLS, BLS, and PALS courses are AMA accredited. §6827. Mandatory continuing education. During each triennial registration period an applicant for registration shall complete a minimum of forty-five hours of acceptable formal continuing education, as specified in subdivision four of this section, provided that no more than twenty-two hours of such continuing education shall consist of self-study courses. In order to be admitted to the State final practical skills examination all CFR, EMT and/or Advanced EMT students must pass CPR testing based on the criteria published in the American Heart Association’s “Guidelines 2010 for CPR and ECC”. Testing must include adult and infant obstructed airway procedures, adult 1 and 2 rescuer CPR, child and infant CPR. All documentation pertaining to CPR must become apart of the student files. The course sponsor may use CPR educational materials from the American Heart Association, American Red Cross, National Safety Council or other equivalent educational material which meets the AHA Guidelines 2010. Total number of locations: 95. These locations CAN provide American Heart Association-branded provider cards if needed. Paramedic Derek Sonnenberg was off-duty at a local restaurant when an 86 year old individual began experiencing chest pains. While emergency services were called, Sonnenberg began CPR on the individual and was able to get a pulse on the patient. The Marysville EMS arrived and transported the patient to the hospital. Bruce Daily, a 76 year old lifeguard instructor collapsed due to a heart attack. Luckily for him, 4 women who were present at the class knew how to tackle such situation. Jennifer Jones, Lila Harris, Sue Shove, and Afton Freshman Liv Harris-Morris jumped to action by providing CPR assistance to the dying instructor, they inmediatly began doing chest compressions and rescue breathings while calling for the EMT and looking for the Automatic External Defibrillator. After 3 shocks with the AED the instructor regained consciousness and was taken to the nearest hospital by the paramedic team. Luke Benrud was the hero of the day. He was resting with his wife who just gave births a few weeks ago when suddenly, Andrea Benrud dropped to the floor with no breathing. Luke remembered the training he received and started administering CPR to her until paramedics arrived to take care of the situation.